An Aedes japonicu mosquito rest on the water surface from which it just emerged. 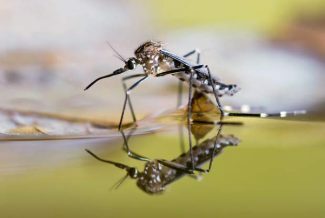 Wyoming officials are getting tactical with the mosquito population after recent flooding that left parts of the state with acres of standing water. According to Scott Schell, an entomologist with the University of Wyoming in Laramie, Wyoming is home to 45 species of mosquito, ranging from carriers of West Nile Virus to just the hardest biters. "We are experiencing a big pulse of floodwater mosquitos," Schell says, "And the emergent vegetation is the perfect environment for mosquitos as well." Schell and abatement specialists from Laramie are meeting in Lusk Wednesday to come up with a strategy for knocking down several floodwater species as well as the variety that spreads West Nile. Lusk, a small farming and ranching town located near the Nebraska border, was hard hit recently when the Niobrara River and a local creek left their banks, submerging the community. The flood took out bridges, closed two highways, cost some people their homes, tore out fence and killed livestock. Even the new state Weed and Pest building was swamped. There was some drying out of carpet and cleanup needed, but the chemical storage building was spared, Schell says. Wyoming was once listed in the top five states in the country for West Nile disease. The state has made inroads since, and abatement workshops held in Laramie every May continue to educate counties about mosquito control. The Laramie Valley is also home to some of the state's best-producing irrigated alfalfa fields, and that means prime mosquito habitat. The abatement district encompasses 15,000 acres. Mosquitoes fall into a couple of categories. They are either part of a permanent pool or a transient population. Both need to be dealt with. "We have really tried to get out ahead of them this year," Schell says, "and a lot of that is aimed at the vector of West Nile, and of course our ultimate goal is to protect citizens." At some point, the federal agencies of the Centers for Disease Control and the Federal Emergency Management Agency start pitching in. Grant money may be available for places like Lusk, but that means gathering data. Says Schell: "Areas like Lusk that were hard hit with floods, the floods have upset infrastructure. Displaced people are spending more time outside working hard mopping up, and so they are more vulnerable." Repellent is a help, but it is not foolproof. "They still get in your mouth and on your face and just make you miserable," he says. At the beginning of the season, spring birds feed on mosquitos, and some of those birds get infected with West Nile. Mosquitos start feeding on large mammals like horses and people. Fortunately, people are what are called "dead end hosts." A mosquito that bites an infected person does not spread it to the next. "They are not like a flying dirty syringe," Schell says. In the field, abatement crews use a variety of tactics. They deploy traps that use fans to help capture bugs. Those traps use light and even dry ice, which gives off tempting carbon dioxide, to lure in mosquitos. Killed or stunned bugs are separated from other species, counted, and tested for disease. Abatement crews also use a bacterial larvicide that interrupts the mosquito's life cycle, killing it off. It is not a chemical, but it is regulated by the Environmental Protection Agency. The same substance can be purchased by private citizens over the internet, but counties like Hot Springs County south of Cody are giving it away. There, the agricultural hub of Lucerne took a lashing when local waterways swelled and came down the mountain. Shawna Farrell, office manager for Hot Springs County Weed and Pest, says locals have been keeping her busy. "We've had a huge hatch here," she says. "Our portable foggers that are just right for four-wheelers, we have those to loan and they are going out the door like crazy. The landowners keep them for a few days and bring them back and then they right back out to the next person." Lindsey Woodward, district supervisor, says the county has been busy larviciding and the district is also using traps. On a weekly basis crews do what are called "water dips" to count mosquitos. If the number of larvae in a dip is high enough, it gets treated. The ground fogger, which gets deployed by truck, is up and running and before the month is out Weed and Pest will starting treating from the air. Woodward said the plane is pretty popular with residents. "Whenever first cutting starts, people want to know 'When are you guys going to fly?'" The cutting of alfalfa stirs up the mosquitos that have bedded down in the crop. The tail waters of flood irrigated corn and alfalfa fields are always a major source of infestation, but recent cool weather has slowed down the hatch rate, Woodward says. Lucerne remains the district's biggest "red zone." Jim Andreen is Hot Springs County's mosquito abatement coordinator. He said this year's unusual weather has been both a help and a hindrance. "It's been a trade-off," Andreen says. "We've had more standing water, but the recent cooler weather has been working in our favor and with the high water flushing larvae downstream, they have not been able to complete their full life cycle." Going forward, as waters recede, low-lying areas that hold on to water will become a focus, as well as areas thick with brush like Russian olives. Landowners can help themselves by keeping properties free of weeds, clutter, and trash; treating ponds and emptying bird baths nightly; adding bat houses to attract native bats; and adding gold fish to stock tanks. Mosquitos are most active at dawn and dusk. If you're going to be out then, Andreen says, it's best to wear long sleeves and pants.